Stock photo of the Manitoba Legislative Building's entrance and tower against a deep blue sky as seen from Manitoba Plaza in the City of Winnipeg, Manitoba, Canada. The Legislative Building against a deep blue sky as seen from the Manitoba Plaza in the City of Winnipeg, Manitoba, Canada. 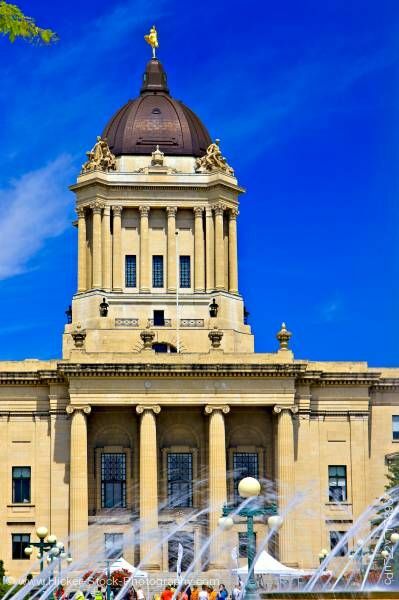 In 1911, the Manitoba government announced an architectural competition to all architects in the British Empire, with a grand prize of $10,000 was offered for the best design for the new Manitoba Legislative Building. It is the third building used by Manitoba's legislative assembly, the first being the home of A.G.B. Bannatyne, while the second stood on the same grounds as the current Legislative building. Of the 67 submissions, Frank Worthington Simon, a former student at the Ecole des Beaux-Arts, had his design chosen for the construction of the impressive structure.